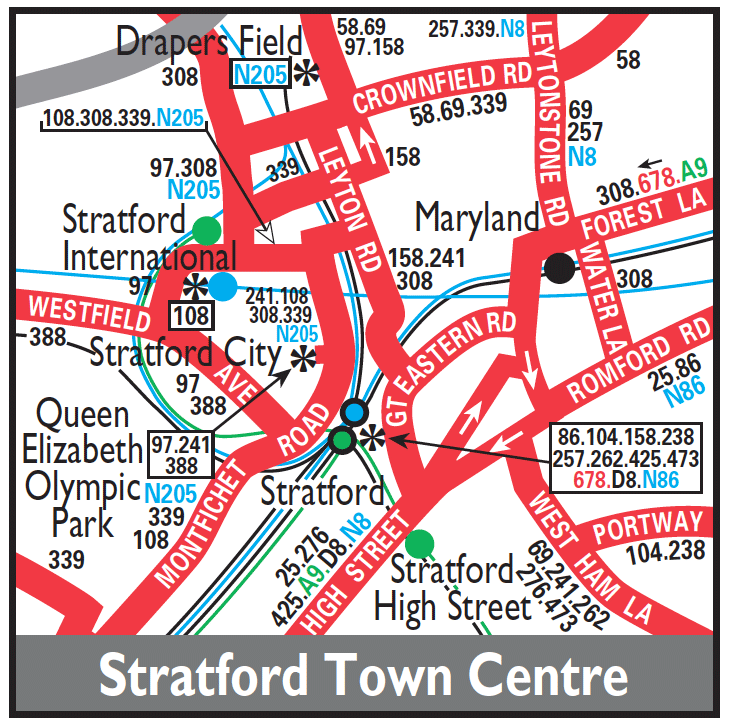 Mon-Sat extended from Stratford to Chingford Mount - part replacing withdrawn trolleybus 699. There were then no changes for 8 years apart from extra buses weekdays coming off Route 25 thus RT and RTL being used. Sunday Poplar (PR) allocation introduced. Sunday Poplar (PR) allocation withdrawn. Sunday Route reverted to RM. Mon-Fri Leyton (T) allocation withdrawn. Sunday Leyton (T) allocation introduced. Sunday Leyton (T) allocation withdrawn but new Sat and Sun Walthamstow (WW) allocation introduced. NORTH WOOLWICH - CHINGFORD STATION. Mon-Fri Leyton and Walthamstow allocation added. Mon-Fri Leyton allocation transferred to Walthamstow. Withdrawn between Chingford Mount and Chingford Station. WW withdrawn. Mon-Fri Leyton re-introduced. Sunday Route converted to Titan one person operation. West Ham converted to Titan crew operation. Sunday Route extended from Chingford Mount to Chingford Station. T allocation withdrawn. Mon-Sat extended from Chingford Mount to Chingford Station. WW allocation re-introduced. Withdrawn between Walthamstow Central and Chingford Station. WW withdrawn. West Ham (WH) closure - allocation transferred to Leyton (T). Diverted at Connaught Bridge to London City Airport - Silvertown to North Woolwich section replaced by new 474.